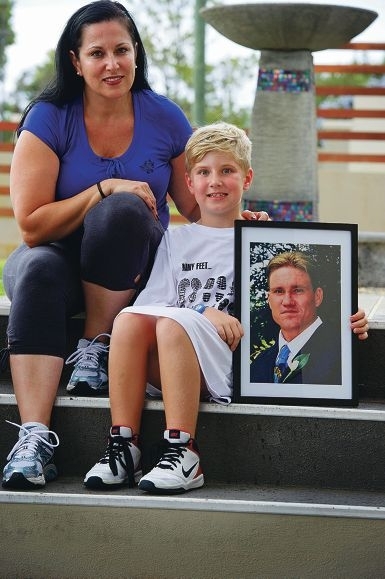 ‘I believe Mark signed up for the tower climb for a personal achievement but also, he was a focused, strong-willed and determined man who wouldn’t give up on anything in life,’ Mrs Stolp said. She said Mark, a leg amputee, was aware of others who had completed the stair climb of Perth’s tallest building, Central Park, and so he knew he could, too. ‘Also, being physically impaired, he wanted to give something back to others in similar situations,’ she said. Over three years ago, Mr Stolp had a workplace accident resulting in a complete rupture of the right quadriceps, and an infection. Over the next two years, he had 25 operations and spent 45 weeks in hospital before making the difficult decision to have his right leg amputated above the knee. In the following year, he had another 10 operations and was in hospital for more than 30 weeks. Then exactly three years after his accident, on January 11, Mr Stolp, died aged 44. ‘I am still waiting for results on the outcome of his death, which has been extremely frustrating,’ Mrs Stolp said. Mrs Stolp said she thought her husband would have been proud that she was taking his place in the stair climb. ‘This also shows Jett that no matter what adversities you are faced with, never to give up on what you feel is the right thing to do,’ she said. ‘From the strength and love I received from Mark, it would be an honour to do this for him. But Mrs Stolp is facing a challenge in taking on the stair climb, having recently had a procedure on her knee and only limited time to train. ‘I know that although Mark is not physically here, he will climb it alongside me. ‘I can guarantee that emotion will hit me once I get to the top. To donate to the fundraiser, visit StepUpforMS.org.au.